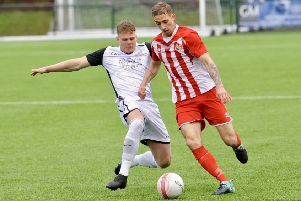 Hastings United Football Club manager Chris Agutter is looking forward to having another crack at the team which inflicted the heaviest defeat of his reign as manager. Agutter’s side will travel to fourth-placed Greenwich Borough in Bostik League Division One South tomorrow (Saturday) eager to improve on its 5-2 defeat in January’s reverse fixture. Agutter said: “I watched the game back the other day and despite my errors in terms of team selection on the day, you almost forget we were 2-1 up and could’ve gone 3-1 up. “As poor as we were on the day, we missed good chances at important moments, and they had six shots on goal and scored five. “I know we’re a better side than we were then and I won’t be making the same errors in terms of team selection so we go into it confident. If we play our way very well, we will give them an awful lot of problems. Having picked up 16 points from a possible 18, Hastings are up to eighth in the table and are second in the form table for the last six games. Sinnkaye Christie should recover from the bruised toe which kept him out of last weekend’s win over Shoreham.